Using a 4G / LTE network, the Icom PoC (Push-to-Talk Over Cellular) radio system provides licence free nationwide communication and instantaneous high-quality full duplex operation. 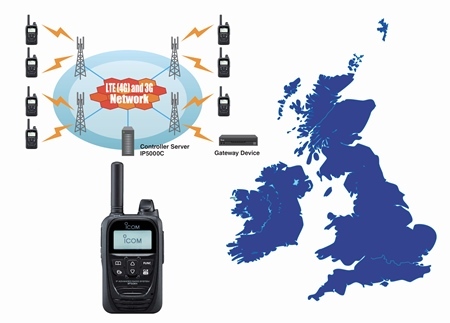 The PoC system uses the mobile phone network thus reducing the cost of building and maintaining a wide area radio network. * Network coverage provided by custom ICOM SIM card. System will fall back to a 3G network if 4G is unavailable. Icom’s PoC radio system allows you to communicate with your two-way radio system over a 4G / LTE closed private network. Now you can benefit from nationwide coverage for your business without the use of repeaters thus reducing the cost of building and maintaining a wide area radio network. The closed system will operate from a private LTE mobile data network providing an extra level of security. The Icom PoC system provides a flexible way of financing your radio system. You can pay for each handset on a monthly contract like you would a mobile phone. No need for the initial financial outlay on handsets and infrastructure. The IP501H enables the use of full-duplex communication which provides smooth telephone style conversation with PTT operation. The LTE/PoC Radio System uses 4G / LTE and multiple users can initiate calls respectively, without interfering with each other. There is no requirement to check or wait for channel availability. The LTE/PoC Radio System supports group call with three or more people. In case of emergency, you can break into an on-going call to transmit an important message. With the help of a Gateway*, the IP501H PoC system will provide interoperability with an IP phone, analogue transceiver, IDAS digital transceiver and IP100H wireless LAN network systems. In addition, GPS positional data can be displayed on a dispatcher. * Gateway device is coming soon! Our PoC Dispatcher Manager will allow you to monitor and keep in touch with your team from a PC. It will also log and store a recording of all radio traffic. • High quality, clear audio. • Individual, Group and All Calls. • The IP501H PoC Radio is equipped with an emergency button and emergency related features including Man Down function and lone worker function. • Vibration alert function notifies of incoming calls. • Text message reception and pre-programmed message transmission. * Gateway device required for GPS data will be available in the future.